Blinds are a very popular these days as they give you very flexible solutions for privacy and keeping out light. Venetian blind- Classic blind. Standard sizes can be trimmed to size but its fiddly. Tend to be a bit of a pain to clean. Roman blind- Stylish. Can't be trimmed to size so be careful when measuring up. Roller blind- Inexpensive and reliable. Standard sizes can be trimmed to an exact size. Blind are all fairly straightforward to put up. They will come supplied with the fittings you need which are essentially a bracket at each side and maybe one for the middle if the blind is very long. If they come supplied with plugs and screws you need to make sure these are going to be suitable for where you are screwing into. If in doubt don't use them and refer to drilling and fixing. The brackets are usually designed to be screwed horizontally or vertically so you can choose where to attach them (screwed to a window frame, screwed hanging down from the window recess, or on the wall of the room.) Once you've got the brackets up the blinds simply clip the blind in place. 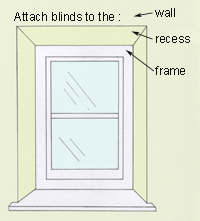 As with shelving it is important to get a good solid attachment AND that the blinds are level. If they are only slightly un-level when the blind is unfolded it will look terrible. This is especially a problem with roller blinds because additionally the blind will tend to want to roll itself to one side and may eventually damage that side.